Greetings from sunny but cold Orlando, where the inaugural Forrester Data Strategy & Insights Forum just wrapped up. During the event, I spent time with a seasoned data professional who joined me as a panelist in my session and who took advantage of the wealth of wisdom dispensed in keynotes and deep dives throughout the event. The feedback on the event was overwhelmingly positive, but one observation struck a chord — particularly given the title of the event. There is no such thing as “data strategy,” he argued adamantly; it’s not a strategy per se, he explained, but rather the execution of initiatives that support a broader business strategy. While not in those words, I’ve been saying the same thing for some time and hope that the sentiment is reflected in my recently published report, “Prioritize Data And Analytics Requests” — although I suspect it’s not that clear. The genesis of the report was an inquiry in which a client asked, “Is a dollar of cost savings the same as a dollar of revenue generated?” My response was a resounding “no.” Data and analytics initiatives must align with business objectives. If a company is in growth mode, hell-bent on capturing mind and market share, insights teams prioritize revenue generation over cost savings. 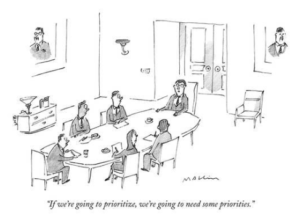 In a downturn, when survival mode kicks in, priorities might look a little different. This exercise is not about defining a data strategy but about identifying, prioritizing, and executing initiatives that best support a company’s business strategy and strategic objectives. On Monday, I presented the new report to Forrester’s Customer Insights & Analytics Council members. 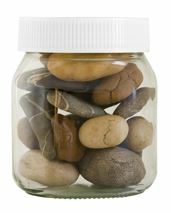 We discussed the proverbial jar, which represents time, with piles of rocks, pebbles, and sand that represent strategic initiatives, urgent but smaller projects, and more routine tasks or even busy work, respectively. At the end of the session, members were asked to share their “rocks” for 2019. One of the council members shared that his “rock” for 2019 was to identify a “rock.” When teams are busy responding to a flood of requests from across the business, they risk not taking the time to identify those larger, more strategic projects that can drive transformation, competitive advantage, and differentiation. It’s time to find those rocks that support the business strategy. And maybe more importantly, “Just because you can doesn’t mean you should.” Another council member shared a story of an initiative that would have improved one metric but might have had an impact on the reputation of the company; the firm didn’t act on the insights. A formal prioritization framework ensures that initiatives are evaluated equally and transparently, that insights initiatives support business strategy, and that resource requirements and expected outcomes align.